Ours is the name involved in offering high performance FRP Cooling Towers. 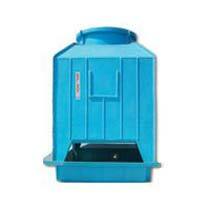 Owing to its compact design, lightweight and easy usage, our FRP Cooling Towers are extensively in demand. Owing to our streamlined inventory system, we are able to meet the bulk as well as urgent requirements of the buyers with ease. More Information : We have a wide Range of FRP cooling tower for Industry rang starting from 5 TR to 200 TR Capacity in different Shapes.